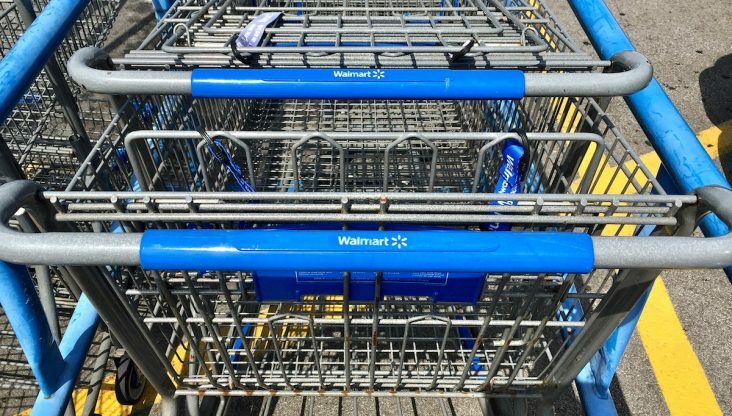 Walmart recently filed a patent on a shopping cart where the handle gripped by the shopper can track biometric feedback such as heart rate, temperature and shopper’s pace. The patent is titled “System and Method For a Biometric Feedback Cart Handle,” and it published Aug. 23. The patent was filed in February by Walmart Apollo LLC of Bentonville and inventors named on the report include Aaron Vanguard of Rogers, Nicholaus Jones of Fayetteville, Matthew Jones of Bentonville and Kurt Bessel of New York. The abstract description of the invention says data is collected through sensors on the handle of the shopping cart and transmitted in real time to a data bank in the back room. Upon analysis of the data in near-real time a store employee would be notified if a shopper is experiencing elevated pulse rate, clammy hands or other symptoms detected in the data. The goal of this biometric shopping cart handle is help warn consumers who may be experiencing signs of a serious condition such as stroke or heart-attack. Walmart said the server can build a database of information compared against store location and stress response. The patent abstract also lists other uses for the device such as inclusion of a pulse oximeter that can detect when a shopper may be about to faint. A weight-triggered assisted push feature on the cart would then kick into gear and propel the cart by itself. Other uses include being able to detect when a shopper is agitated or stressed. A millennial consumer in Columbus, Ohio told Talk Business & Politics she sees HIPAA privacy concerns at risk if the data is transmitted to non-medical personnel. Likewise, another Millennial shopper in middle-Tennessee said she would have to pass using such a cart because she does have privacy concerns. Even if the retailer doesn’t voluntarily share the data, there is still the risk of it being hacked. Jennie McDonald, a Generation X shopper from Farmington, said she doesn’t like the notion of a retailer collecting health data. She would use the cart only if there was a way to opt out of the data collection. “I really feel like there is too much technology and too much information going around. Plus from a medical standpoint, it could cause an alert when not needed. Everyone’s body is different. Blood pressure rates are different for everyone. One person’s high could be another person’s low depending on their medical background, I don’t see a way to do a determination based solely on a hand grip. Medicine is science not technology,” McDonald said. The retail giant has already garnered a patent for a robotic shopping cart which was approved in 2016. This cart would drive itself back to the rack when abandoned by a customer. Other applications for this robotic cart involve the placement of sensors throughout store which allow robotic shopping carts to tour about safely carrying products toward the customers saving them steps during their trip. These robotic carts could potentially use customer and sensor information to track down products in the store, access its inventory, and engage in cross-selling by suggesting complimentary items. Bryce Paden, founder of i2i Labs in Rogers, recently told Talk Business & Politics his firm was testing a robotic shopping cart for a retailer that does product returns. He said autonomous carts haven’t been practical but using them for returning items to shelves by store employees is one application that makes sense. This cart not only drives to the aisle but when the item is scanned into the monitor on the cart the inventory is adjusted in the retailer’s system. Paden said sensor technology prices have declined in recent years and the biggest challenge for retailers is trying to figure out how to use the technology to do something humans can not do, not merely replicate human movements.